In this "blog", I want to collect music, demos and other stuff I come across and want to share with others. If you want, you may also subscribe to this blog. Well, maybe not. 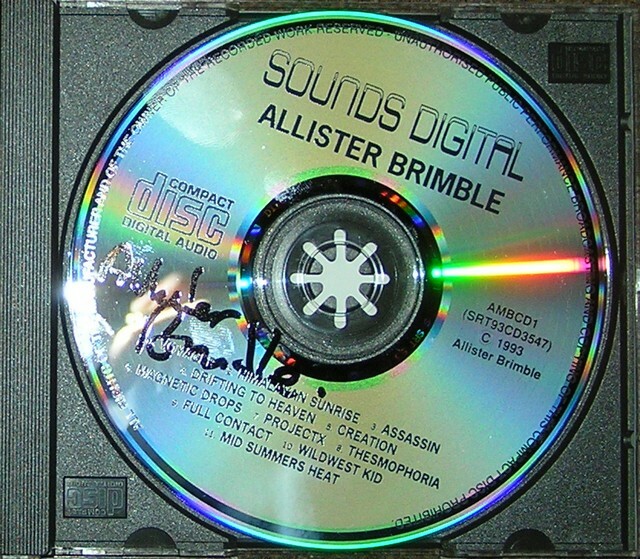 But today, I finally received my two signed copies of Allister Brimble's Sounds Digital and Bang! Tick... Tick from m0d who got them for me without asking first when he met Allister at Sundown 2008. I can't say anything but "Thank you" right now, those CDs are just awesome. Be sure to listen to the free recordings at Exotica (linked above) if you don't have the CDs, because this is definitely music that's worth listening to. In May, we had an one hour compo with the samples of "Deep In The Forest" at #mod_shrine. After the compo, I wanted to listen to the tune that was behind these samples. Found it at ModArchive, downloaded, listened. It was a great trance track. I also downloaded the 12" version as well as some other tunes by the creator, DJ Bourg. Good stuff! The S by Suspend - This demo looks really, really polished and clean if you consider that it's "just" from 2002. STS-05: Royal Temple Ball by Synesthetics - I've seen this demo at Breakpoint 2008 (scene.org awards 2007) on the bigscreen and it didn't cease to amaze me since then. Gamma by Outracks - Another gem from the scene.org awards 2007. Extremely cool and well-synced demo with a great D&B soundtrack. Deserved to win. Daydream by Hedelmae - I think this should win the scene.org award for best music in 2008. I've planned this project for quite some time now and realized everything today: A little blog to share scene thoughts, music, demos and other stuff with others. Hope you like it and find some gems among the links I post here. I've rediscovered another gem in my playlist today: I let Mush - Spirit into the Mod Archive in May and totally forgot about it since then. Today I listened to it again and it didn't cease to fascinate me. It sounds so much like the old Amiga days, it sounds how Amiga tunes are supposed to sound, this is true oldskool feeling. Today, I've come across a tune in my playlist that I've probably listened to one or two times in the past and I realized how good it is for the first time: Face I Paint by Hunz. I've looped it all the day and I gotta say it's a marvellous track. Don't miss it. I have followed the development of TMA for quite some time and over time, I ascended: I've become a reviewer in 2006 or 2007 and also got the ability to assign modules to other artists' profiles ("crew helper"). Then I joined the screening crew to filter the incoming uploads in 2007. In February 2008, m0d offered me to moderate the forums as well. Now, in October, I've gained the status of a full crew member. I have to thank m0d and the whole crew a lot for this, it really means something to me.